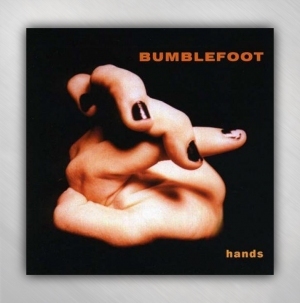 "Hands" is the debut CD of Ron Thal as "Bumblefoot" - experimental hard rock combining intense music with humorous lyrics. Fans of Red Hot Chili Peppers, Frank Zappa, Frank Zappa, Faith No More, Mr. Bungle or Primus will enjoy this record. Musicians and enthusiasts of progressive rock will also appreciate the performances on this record, as well as anyone looking for atypical lyrical content. The album art is a collection of artistic photographs of twisted and malformed hands.